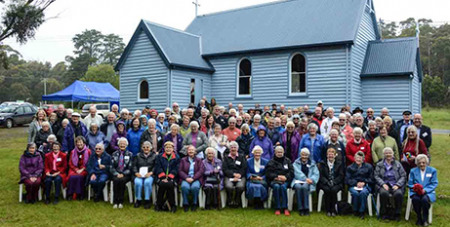 The Missionary Sisters of Service (MSS) commenced a year-long celebration marking the order's 75th anniversary with a pilgrimage across Tasmania to Bruny Island, where the congregation was founded. Source: Highways and Byways. A group of 28 pilgrims from Queensland, Victoria, South Australia and Tasmania, including 13 MSS and 15 friends and colleagues, spent five days travelling through Tasmania last month visiting sites important to the congregation's history. The pilgrimage commenced at Calvary St Vincent’s Hospital in Launceston, which is the site of the first "foundation house" of the then-Home Missionary Sisters Our Lady. In the chapel at St Vincent’s, MSS congregational leader Sr Stancea Vichie led a reflection that acknowledged the courage and foresight both of MSS founder Fr John Wallis and the four initial women who joined the order. Acorns from the same oak tree that stood in the front yard of the foundation house and is still thriving in the foreground of St Vincent’s today were handed to each of the pilgrims. After visiting further places significant to the MSS story in Launceston, the bus took the pilgrims to Scottsdale and Derby, the first parish the early sisters visited on mission. Over the following days the pilgrim bus worked its way to Hobart via Longford, Oatlands and Richmond. Stories of the Sisters’ early missions in each of these areas were read over the bus microphone so that the pilgrims could deepen their knowledge and understanding of the extensive work and impact contributed by the MSS in each of the areas. The climax of the pilgrimage arrived on Sunday, 25 November, when the pilgrims journeyed to Alonnah, Bruny Island, joined by three Tasmania-based MSS, along with another busload of pilgrims, and many others who travelled independently.